In his New York Times bestseller Wheat Belly, Dr. William Davis changed the lives of millions of people by teaching them to remove wheat from their diet to reverse years of chronic health damage. Now he'll go beyond cutting wheat to help you take charge of your own overall health in Undoctored. Dr. Davis wants you to understand that conventional medicine is no longer working in your favor. He will expose how millions of people are prescribed unnecessary medications, given dietary recommendations crafted by big business, and undergo unnecessary procedures recommended by healthcare practitioners to feed revenue-hungry healthcare systems. He then shows how the modern boom in information tools can be applied to create a comprehensive program to reduce, reverse, and cure common health issues through simple strategies, including harnessing the collective wisdom of new online technologies, so that you can break free of a health care system that puts profits over health. Undoctored is the spark of a new individually-empowered health care movement. The results of Dr. Davis’ 6-week program are superior to solutions provided by the conventional healthcare system. You will be equipped to manage your own health and sidestep the misguided motives of a profit-driven medical system. 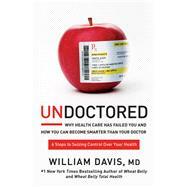 WILLIAM DAVIS, MD, is a New York Times bestselling author and a cardiologist who advocates unique, insightful, and cutting-edge strategies to help individuals discover the health hidden within them. His blog, wheatbellyblog.com, has been visited by millions of people. Dr. Davis has also shared his passion for wheat-free living on national television shows including The Dr. Oz Show and CBS This Morning. His Wheat BellyTotal Health program has become a public television special, now airing nationwide. He lives in Wisconsin.